The opening bars and main theme of No.1. The Nocturnes, Op. 9 are a set of three nocturnes written by Frédéric Chopin between 1830 and 1832, published that year, and dedicated to Madame Marie Pleyel. 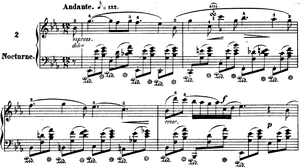 The second nocturne of the work is regarded as Chopin's most famous piece. This nocturne has a rhythmic freedom that came to characterise Chopin's later work. The left hand has an unbroken sequence of eighth notes in simple arpeggios throughout the entire piece, while the right hand moves with freedom in patterns of seven, eleven, twenty, and twenty-two notes. The opening section moves into a contrasting middle section, which flows back to the opening material in a transitional passage where the melody floats above seventeen consecutive bars of D-flat major chords. The reprise of the first section grows out of this, followed by a Picardy third ending. Performed by Martha Goldstein on an 1851 Erard piano. Chopin composed his best-known Nocturne in E-flat major, Op. 9, No. 2 when he was around twenty years old. This well-known nocturne is in rounded binary form (A, A, B, A, B, A) with coda, C. The A and B sections become increasingly ornamented with each recurrence. The penultimate bar utilizes considerable rhythmic freedom, indicated by the instruction, senza tempo (without tempo). Nocturne in E-flat major opens with a legato melody, mostly played piano, containing graceful upward leaps which becomes increasingly wide as the line unfolds. This melody is heard again three times during the piece. With each repetition, it is varied by ever more elaborate decorative tones and trills. The nocturne also includes a subordinate melody, which is played with rubato. A sonorous foundation for the melodic line is provided by the widely spaced notes in the accompaniment, connected by the damper pedal. The waltz-like accompaniment gently emphasizes the 12/8 meter, 12 beats to the measure subdivided into four groups of 3 beats each. The opening bars and main theme. A part of the "C" theme. John Rink "Structural momentum and closure in Chopin's Nocturne Op 9 No 2" in Schenker Studies 2 (ed. Carl Schachter, Hedi Siegel) pp102–127 Cambridge University Press, 2006 ISBN 0-521-02832-9, ISBN 978-0-521-02832-5. Jean-Jacques Eigeldinger "Nocturne op. 9/2, E flat major" in Chopin: pianist and teacher as seen by his pupils (ed. Jean-Jacques Eigeldinger, Roy Howat) pp77–79 Cambridge University Press, 1989 ISBN 0-521-36709-3, ISBN 978-0-521-36709-7. Eleanor Bailie "Nocturne No. 2 in E flat major" in Chopin: a graded practical guide (Eleanor Bailie, Issue 3 of The pianist's repertoire) pp303–306 Kahn & Averill, 1998 ISBN 1-871082-67-6, ISBN 978-1-871082-67-8. Hillsong Worship christmas worship song "Peace Upon the Earth" use the tune of this chopin piece. The final dance of the ballet In the Night by Jerome Robbins (1970), was choreographed to this music. The opening bars of No. 3 in B major. ^ Johnston, Blair. "Nocturnes (3) for piano, Op. 9". Nocturne in E-flat major, Op. 9, No. 2 – via Wikisource. Nocturnes, Op. 9 (Chopin) at the Mutopia Project.